I alluded to my lack of motivation lately in this post. With longer daylight hours and warmer weather just around the corner, you would think getting outside for a run would be easy. But I have been struggling. The wind, cold, and rain are certainly not helping things either. Here's what my weeks have looked like. 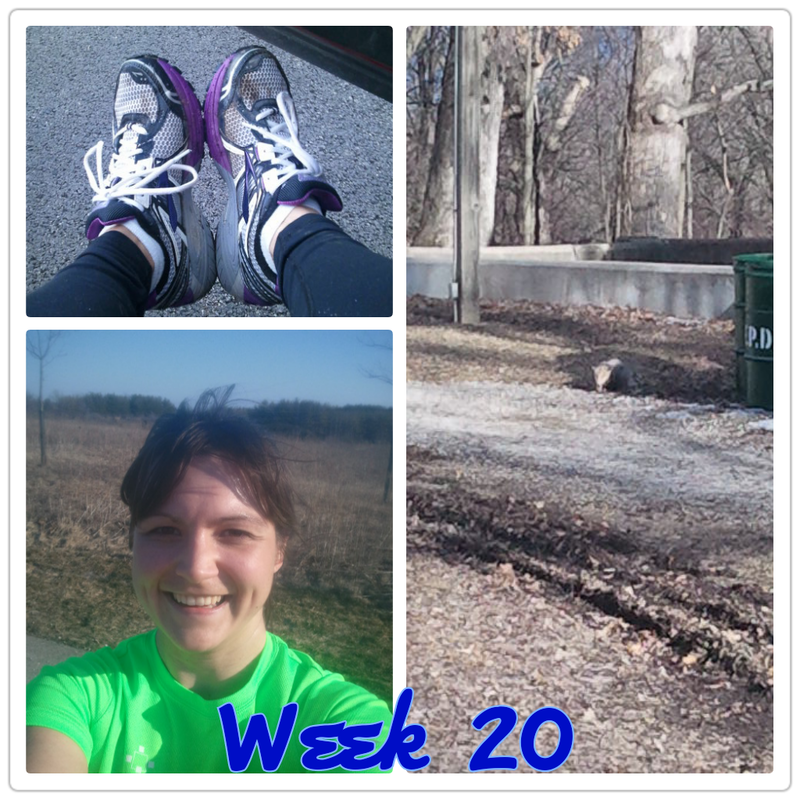 Highlights this week: a very muddy and slushy forest preserve run, possum spotting (can you see him? ), and my first run in a short sleeves this year! Now that I look at these weeks, I realize they aren't too bad. 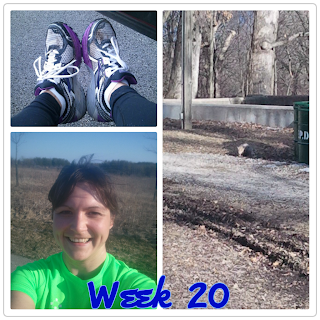 The lack of running from Saturday to Tuesday isn't great, but I still managed to do all three runs in the second week and two runs in week 20. I realize training plans are built to allow some runs to be skipped, but I feel like it is late in the game to be skipping runs. I probably made a bad decision in doing a 7 mile tempo run on Saturday and running a 20 mile run on Sunday, but I really didn't want to have another 2 run only week. Were my legs sore on Sunday? Yes, a little, but not enough to stop me from getting to 20. I'm now officially in the taper portion of my plan! My longest run this week will only be 12 miles and next week will only be 8 miles. Some people hate the taper, but honestly, I kind of like it. Shorter runs allow me to have time to run all the errands, I've been neglecting lately. If I get too anxious about not being able to run long I will just add in some easy cross training sessions like yoga and swimming. I'm debating whether or not to get new shoes now. I added up the mileage on this pair of shoes and they are already at 325+. Granted many of those miles were done on a treadmill which doesn't wear down shoes as fast as outside terrain, but that is still plenty of miles. After my 20 miler on Sunday, my ankles and knees were pretty sore which is normal, but they felt more sore after this 20 miler than they did on the last 20 miler. I would definitely stick with the same kind of shoe if I got a new pair, but I think brand-new padding would help. Is getting new shoes two weeks out from the marathon a good or bad idea? Please weigh in!